Unfortunately, embedding the video was impossible this week, and not even the best efforts of experienced web publishing teachers could help, so click the picture of Mladen or this link to watch this very seeworthy vlogg https://vimeo.com/324219900 . This week, Viktoria Klingenfors is the special guest in the Dean’s sofa due to the newly launched A-Z teacher guide in educational administration. The A-Z offers concise information on various important course administrative aspects that teachers should be familiar with. The teacher guide is also complemented by the TS-utbildning-calendar that you can implement into your own outlook calendar to know all the important deadlines in terms of educational administration. You find the A-Z and link to the calendar on the TS staff pages here. Any feedback can be sent to viktoria.klingenfors@mau.se. Big thanks to the TS kansli for this initiative! Next week, the Dean will visit partner universities in the US, and the vice dean, Bengt J Nilsson, will be in charge in Andreas’ absence. The Software Center, a research center where TS is part, recently received the prestigious 2019 Distingushed Synergy Awared by the IEEE Technical Council on Software Engineering. Today during lunch, Dr. phil. Marcel Köhler from Dresden Technical University held a pedagogical seminar on operators in tasks of written examinations, as announced in this blog last week. The TS teachers who attended asked for the presentation to be shared with them and suggested that all should get to access the interesting presentation. The presentation held by dr. Köhler can be found here. This week, the Dean blogs about the IoTaP-seminar on AI by Dr. Costas Bekas from IBM on Wednesday, an opportunity to take part in a pilot project to try out digital written exams, and an opportunity to let the Advisory Board for Collaboration and Innovation know of any obstacles you have met in trying to collaborate with external organisations. The Dean informs about the Faculty Board decision to allow all three step 2-applications for new master programmes be forwarded to the Programme Committee, and that the members of the new Faculty Board are now appointed. Last, but not least, the Dean asks all researchers to assist Paul, Romina and Paul, in completing their tasks as ERA19-coordinators. If you want to try digital written exams in your course, write to Jörgen Ekman at jorgen.ekman@mau.se. If you want to let the Board for Collaboration and Innovation know of any obstacles you have experienced, write to Mats Persson at mats.persson@mau.se, by 4 April. This week, the Dean informs about the UKÄ evaluation were MAU was approved with the condition to improve the course evaluation aspects. Furthermore, he sums up the quality dialogues held on Tuesday. He also reminds you that you should make sure you know about the work environment policy. On the 29th March, Niclas Andersson invites you all to a lunch seminar on examinations by Dr. Marcel Köhler, the Technische Universität Dresden, see your outlook invitation for more information. Due to very unfortunate circumstances, the last clip where the Dean bows and wishes you all a good weekend in Japanese, was lost, so we leave that to your imagination. This week, Annabella Loconsole is informing about the electives presentation for DVMT programme students on Monday 18th March 13:15 in Orkanen. Also, Christina Bjerken is telling about the two new courses to be launched called “Global Product Development I” (MT195A) and “Global Product Development II” (MT295A) to give engineers tools to meet the UN Sustainable Development Goals. This week, the Dean vlogs on the topic of festivities and celebrations,and shows the new plaque naming the TS doctoral students during the past 19 years and their fields of research. As TS has two seats in the brainstorming session for new ideas for the MAU annual conferment and inauguration ceremony, we ask those of you who have ideas about how the ceremony might best celebrate the University to volunteer. He reminds you of the chance to nominate honorary doctors as well as the importance to vote in the faculty board election by 17th March. 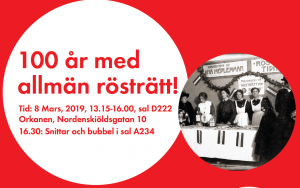 Contact research officer Susanne (Sussi) Lundborg at susanne.lundborg@mau.se regarding your interest to participate in the Årshögtid-brainstorming on 27th March and with your nominations for honorary doctors by 25th March. This week, the dean tells about the first meeting with the TS LGmax management group, the recently launched MAU annual report 2018, the application period for the Rudolf W. Palm grant (details posted here) as well as Jose Font’s docent lecture on 5 April. The Rudolf W. Palm Foundation was one of the funds transferred from Lund University to Malmö University in conjunction with the new university status. The criteria for receiving Rudolf W Palm Foundation funding are strongly aligned with education at the Faculty of Technology and Society and any purposes that are prioritised by the faculty management. The Faculty Dean would like to see proposals to be submitted to the grant committee for consideration. The grant total is SEK 100 000 for 2019. Employees at the Faculty of Science and Technology are welcome to send proposals to their Heads of Departments. The proposal should include the aim of the proposed project and how it will be of importance to the faculty, the main-applicant and co-applicants, as well as an overview of how any funds will be spent. Please send your proposals to Mats Persson or Bo Peterson no later than Monday, 8 April 2019. This week, Jörgen Ivarsson, TS quality coordinator, explains the MAU Quality Assurance Framework for education at bachelor and master level. The video is in Swedish and below is a summary in English. The university has established a Quality Assurance Framework for Bachelor’s and Master’s Education. In this document, seven components of quality assurance work are pointed out. 1 The first component and probably most important is the work done by the teaching staff, the course coordinator and program coordinator within the course and program, the work together with student representatives in the Program Council, the continuous development, the reviewing and revision of syllabi. 2 The second component is closely related to the first one, it is the course evaluation system with student questionnaires and compiling, writing and publishing a course reports for each course. 3 As component three we have the dialogue structure. Every year each program coordinator meets with the vice dean and head of department in a quality dialogue (also called program dialogue). One important purpose is to discuss and follow up the quality assurance work in the program. A few month after this, there are quality dialogues between the department and the faculty, and after this, there are quality dialogues between the faculty (dean) and the university (vice chancellor). With this dialogue structure, quality issues can be discussed and followed up on different levels in the organization. The quality dialogues at faculty and university level also include doctoral education and research. These dialogues of course gives important input to the departments work with budget, operational plan, recruitment plan, and risk analysis. to share good examples and information with colleagues from other faculties. 5 Component five is the process for establishing new programs and new main fields of studies. A new program and a new main field of studies has to be approved and established by the vice-chancellor. The faculty board can apply for this through a step 1- and a step 2-application. 6 Component six. The university regularly conduct student- and alumni surveys as a basis and support for development, review and revisory work. 7 The seventh quality assurance component is external review. Each program is reviewed externally every six years by a assessment panel. The basis for the external review is a self-assessment written by the program together with eight randomly selected degree projects. This week, the Dean informs about the decision not to admit any students for the application development degree programme this fall as well as the pilot project to implement digital written examinations at Malmö university. See more about the digitalization initiative in English here https://digi.mau.se/wiki/The_Digitalization_Initiative and in Swedish and listen to the podd https://www.mah.se/medarbetare/Ledning-och-organisation/Projekt/Verksamhetsutveckling/Digitalisering/. In this week’s update, the Dean informs about a meeting held with teachers of local high schools to discuss the transition from being a high school pupil to becoming a university student. Also, he reports that TS reached the goal for the assigned educational target securing the same level of government funding in the coming years. TS has sent in total five applications to the Crafoord foundation, Mats Persson should be credited along with the researchers mentioned in the vlog. On Monday, the post graduate school on data driven systems, DDS, kicked off, and next Friday, Helena Holmström Olsson will hold her installation lecture as full professor (see blog post below). Last, and perhaps least, there is lego in NIB0501. ”Rösträttens Århundrande” (Century of Suffrage). Three of the authors will present their contributions, Ulrika Holgersson, Ulla Manns och Emma Severinsson. After the lecture, there will be a reception with snacks and bubbles. For more information see poster here and the MAU calendar event. 12 februari: Workshop: ”Genusflum, ovetenskapligt, feminazis – hatet har många namn”, kl. 13.15-16.00, Niagara A0307. Vi bjuder på lunchmacka! Anmälan till erika.svedberg@mau.se senast måndag 29 mars. I tested my new camera in Atlanta and have put together a 3 min video from the City and Campus. This week’s vlog features Team TS visiting Georgia Tech in Atlanta where head of DVMT Bo Peterson and head of MTM Mats Persson along with academic international coordinator Zahra Ghaffari and administrative international coordinator Martin Andersson as well as teachers Maria Engberg, Steve Dahlskog and Johan Holmgren have been to discuss student exchange opportunities and VIP (vertically integrated projects). All are welcome to attend the February 15 inaugural lecture by Professor Helena Holmström Olsson of the Department of Computer Science and Media Technology. The lecture, titled Digitalization Disrupts: Software, Data and AI, will be followed by a reception on Niagara’s 7th floor. Friday, February 15, at 13:15-14:00 in Niagara lecture hall B1. The lecture is followed by a reception at 14:00-15:00 on Niagara’s 7th floor. Digitalization is rapidly transforming not only software-intensive companies but all companies and society at large. Typically, digitalization is understood as using software and data to offer significantly improved products, pure software products as well as digital and data-driven services with the intent to create new revenue opportunities and replace traditional business models with new business models. However, despite the many opportunities, most companies fail in building new core capabilities and they struggle with transitioning towards new digital ways-of-working. This talk explores the opportunities and challenges associated with digitalization. It also provides guidance on how to avoid disruption and instead reap the benefits of a transformation that we have only seen the beginning of. Helena Holmström Olsson is a Professor of Computer Science at Malmö University, Sweden. She got her PhD from University of Gothenburg in 2004. Her research is conducted in close collaboration with industry and as a senior researcher and project leader at Software Center. Her research interests include business and software ecosystems, data driven development, autonomous systems and software engineering for AI systems. She publishes her research in leading journals within the field of software engineering. In this week’s update, Andreas uses Lego to explain how the TS management meeting structure is being changed to prepare for the new Malmö University Arbetsordning (Rules of Procedure), with a TS LG min meeting every two weeks focusing on operations, planning, evaluations and employer responsibilities, and a TS LG max meeting every two months having a more strategic perspective. Also, it is important to mention that student and IOTAP representation will be ensured in the TS LG max, although they were not represented in the vlog. The Dean also mentions that today a TS delegation is heading to Georgia Tech for a contract trip to tighten our collaboration with them. 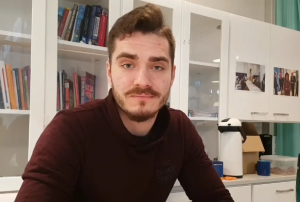 In this week’s update, Andreas talks about the upcoming election to the TS Faculty Board, results of the completed Regulation on Internal Governance and Control (FISK) assessment and the number of applicants to the material science professorship. Information about the risk assessment, conducted as part of the FISK assessment, is listed below. risk that IT-structures are not supporting our activities – here we are working with the IT-department. How might we interact with technology in the future? What might novel teaching methods for children look like? Welcome to find out at Tangible and Embodied Interaction, an annual exhibition by students in the Interaction Design bachelor’s program.